CarGurus has 1,368 nationwide Land Cruiser listings starting at $4,975. Off-road overkill, on-road composure, posh standard amenities, a potent V8 engine, and legendary reliability all contribute to the legend that is the 2011 Toyota Land Cruiser. As a legend, the 2011 Land Cruiser doesn’t come cheap, nor is it at all fuel efficient, and then there’s that uncomfortable, poorly designed third-row split-folding seat. The 2011 Land Cruiser is often mentioned in the same breath as “African safari,” “Himalayan expedition,” and “the lower forty.” Plenty of standard goodies and surprisingly pleasant on-road manners also distinguish this posh ute. Beware, however, that this off-road beast also has a manly appetite for fuel, and that its top-shelf price makes it suitable mainly for those with the means to live or play well off the beaten path. Standing out like a Saint Bernard in a kennel full of Chihuahuas, the 2011 Toyota Land Cruiser will never be confused with a mere automobile. This full-size, eight-passenger SUV has tackled everything from the Serengeti to Baja and come out on top. 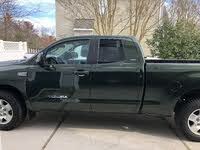 Well-off families on vacation in the Rockies could do worse than tote gear and in-laws with this big ute, though tight cargo space might mean utilizing its prodigious towing ability. And of course allowances will have to be made for the prodigious appetite of its standard V8 engine, despite variable valve timing. After a major re-design in 2008, and unchanged from 2010, the 2011 Land Cruiser offers a lot of off-road capability, yet keeps its composure admirably on the highway and in the city. Such a massive conveyance, however, seems a bit of overkill in the parking lot of the local mall and is aimed, therefore, at a certain clientele that is either very adventurous or very loyal, but in either case seems willing to drop over $68,000 for the privilege of outmaneuvering any mountain, streambed, or desert on earth. Full-time four-wheel drive (4WD) is embedded in this brute’s only trim level, appropriately enough known as the Base. But its appeal doesn’t stop there, with such niceties as a roof rack, trailer hitch and wiring, step running boards, push-button tumble-forward second-row seating, and third-row seat also included as standard equipment. Unfortunately, the third-row seat is a bulky affair that folds awkwardly into the sides of the cargo area, limiting available cargo space to a less-than-impressive 82 cubic feet. On the plus side, Toyota’s much-touted Crawl Control, allowing the driver to worry only about steering while brakes and throttle are managed automatically when ascending and descending steep grades in the wild, is also standard. Available in the U.S. for some 53 years now, the 2011 Land Cruiser’s serious competition has traditionally been the Range Rover, along with its smaller (and cheaper) Land Rover sibling. Lately, the Mercedes-Benz GL-Class has also been making inroads into the terrain-busting business for about the same price as Toyota’s big SUV, though it has a ways to go before it attains the cachet of its rivals. The only powerplant available to the 2011 Land Cruiser is a 5.7-liter V8 that’s managed by a six-speed auto-manual transmission. This potent drivetrain churns out 381 hp at 5,600 rpm and 401 lb-ft of torque at 3,600 rpm, with the transmission featuring a brake hill holder and descent control, while a standard auxiliary transmission cooler keeps it comfortable in extreme conditions. Towing capacity is an impressive 8,200 pounds, but all this power eats gas at an estimated 13/18 mpg. A mechanical, center-mounted, limited-slip locking differential, meanwhile, complements auto-locking hubs and manual hi-lo gear selection to give the full-time 4WD system an edge in backwoods bushwhacking. A big assist is given by Active Traction Control (A-TRAC), as well. Professional reviewers give the 2011 Land Cruiser’s drivetrain high marks for load-carrying capability, highway alacrity, and punch from a stop. Indeed, one test of the Land Cruiser’s 0-60 abilities yielded a time of 7.4 seconds, not bad for a miniature tank, though its tepid (at best) fuel efficiency lowers the appeal of this big ute in the eyes of most. The transmission is noted by reviewers as smooth and quick to drop when necessary, while a saving grace of the big V8 is the fact that it purrs just fine using regular unleaded gas. A further refinement of the powerplant, as noted by a few reviewers, is a valve located just behind the muffler that opens at higher speeds to relieve backpressure, increasing power and allowing the engine note to descend into a contented growl. Basic suspension components in the 2011 Land Cruiser include a double-wishbone front independent suspension, front and rear stabilizer bar, and solid axle rear suspension. This big SUV additionally comes equipped with 18-inch alloy wheels mounting all-season radial tires. All this means most bumps are well damped with little of the bobbing and weaving that, according to reviewers, is often the bane of large off-road-type vehicles. The standard Kinetic Dynamic Suspension System is, in the minds of many reviewers, what gives this heavy sport ute its better-than-average ride comfort. Body lean in tight corners, though not overly pendulous, is noted by several reviewers to be somewhat exacerbated by the Land Cruiser’s high stance. Variable-ratio steering, though, provides what many reviewers describe as a confident feel by reacting faster the farther the wheel gets off center. Maneuverability and agility are, according to most reviews, among the best in this ordinarily clumsy and ponderous class. Braking, meanwhile, is described by most reviewers as powerful and true, with just enough pedal give to ensure comfortable stops in normal driving while allowing the ABS system to do its thing effectively in emergency stopping situations. The standard Kinetic Dynamic Suspension System (KDSS) is, in the minds of many reviewers, what gives this heavy sport ute its better-than-average ride comfort. This unique system is said to allow for considerably more steering control when cornering on paved roads, a smoother ride, and offers greater wheel articulation (wheel travel) over less-than-optimum terrain. Additionally, standard Crawl Control allows automatic brake and throttle adjustment to keep the driver’s attention on steering alone when ascending or descending those obstacle-strewn mountain paths. 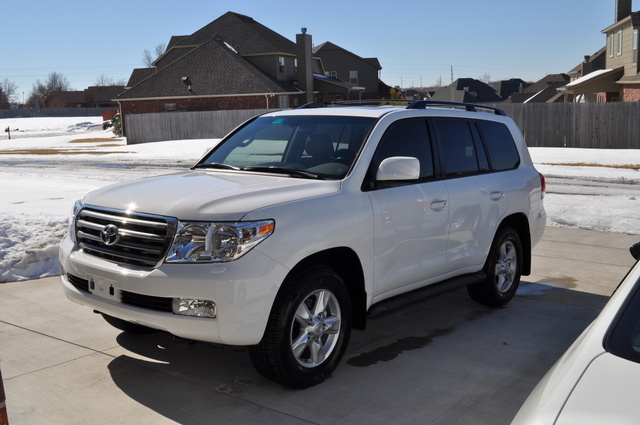 Essentially a luxury SUV (as witness its hefty pricetag), the 2011 Land Cruiser carries just about all the bells and whistles that today’s driver expects and desires. Beginning with a power glass sunroof and leather upholstery, the list of standard cabin amenities continues with eight-way power-adjustable heated front bucket seats, reclining second-row seats, four-zone climate control, telescoping tilt-wheel steering with steering-wheel-mounted audio and cruise controls, remote power door locks, one-touch power windows, heated outside power mirrors, push-button start, and a universal remote garage door opener. Memory for seat, steering wheel, and mirror settings for three drivers and an electrochromatic auto-dimming rear-view mirror are nicely set off by leather trim on all four doors, as well as the steering wheel and center console, while the shift lever is dressed up with leather and simulated alloy trim with grained wood inserts. Entertainment is provided by a standard 605-watt JBL premium audio system that boasts an MP3-compatible 6-CD changer and 14 speakers, including a subwoofer as well as XM satellite radio, and a USB connection for added sound possibilities. Topping off the electronics load is Bluetooth wireless communications technology as well as phone pre-wiring. Believe it or not, even with all of the above, the 2011 Land Cruiser still offers a number of options. A touchscreen and voice-activated DVD navigation unit with integrated rear-view camera, a center-console cooling box, and an integrated rear spoiler, for example, are available standalone options. The optional Upgrade Package, meanwhile, incorporates the navigation system with rear-seat DVD entertainment and XM Navtraffic monitoring, as well as multi-level-heated second-row seats. Reviewers are quick to point out that the Land Cruiser is one of the more well-appointed SUVs on the market, though a few note that so many gizmos and doodads may be a bit intimidating to first-time users. 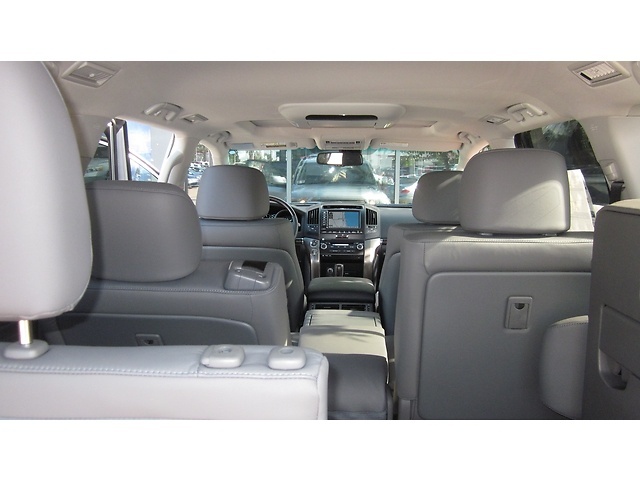 Cabin materials and workmanship are described as top-notch by virtually all reviewers, however, with all touchable surfaces well padded, and front and second-row seats that are supportive and roomy. Push-button tumble-forward second-row seats ease access to the third row, though this same third row is noted by most reviews to be awkwardly designed for efficient folding and set too low for adults to sit comfortably for long periods of time. Front and second-row head- and legroom are plentiful, according to most reviewers, with excellent visibility except to the rear corners. Gauges and controls, meanwhile, draw praise by reviewers for being easy to see and conveniently located, with backup for most functions provided by a well-regarded center touchscreen display. Though uncommon heft and size are perhaps its best defense, the 2011 Land Cruiser is equipped with an impressive array of standard safety features. Four-wheel disc antilock brakes (ABS) with emergency braking assist and electronic brakeforce distribution as well as traction and stability control help keep this big ute out of trouble on the highways and byways. Dual front side-mounted airbags and three-row head curtain airbags, meantime, along with a front head restraint whiplash protection system protect occupants in the event of a collision or rollover. Then there are such additional standard safety items as daytime running lights, front fog/driving lights, rear parking sensors, a remote antitheft alarm, and a post-collision safety system. Finally, Toyota’s standard Safety Connect System provides emergency roadside assistance, as well as stolen vehicle tracking and airbag deployment notification, while the Smart Stop system reduces engine power while enhancing braking power in emergency stopping situations. Advanced self-tightening seatbelts, headlight washers, and rain-sensing wipers are part of the available Upgrade Package. 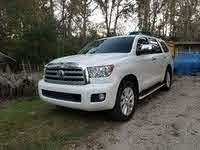 No safety data on either the 2010 or the 2011 Land Cruiser is provided by either the National Highway Traffic Safety Administration (NHTSA) or the Insurance Institute for Highway Safety (IIHS). Doubtless this is due to this titan’s aforementioned sheer bulk. Obviously, owners of the 2011 Land Cruiser are well aware of its legendary capabilities. A few downsides, however, have been noted, among them an over-the-top pricetag and that pesky third-row folding-seat setup. An additional complaint, mainly from those who have merely kicked a few tires, is the horrific gas mileage that comes with the territory of large, powerful, off-road-capable SUVs. Exterior styling seems a matter of opinion among owners and wannabes, with some admiring the manly, no-nonsense profile, and others deploring its seeming lack of imagination. Notwithstanding its imperfections, impressive off-road skills are what draw most owners to purchase this plush ute. Others claim further that the plethora of standard features, surprisingly civilized road manners, trailer-friendly V8 power, and Toyota reliability, including stratospheric resale value, keep them coming back for more of the Land Cruiser experience. What's your take on the 2011 Toyota Land Cruiser? 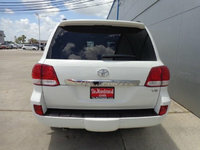 Have you driven a 2011 Toyota Land Cruiser? 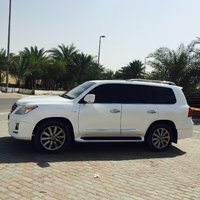 What Are Good Tires For A Land Cruiser? what are good tires for a land cruiser? I had Michelin Latitude tires on my Land Cruiser and they have to be replaced after 40K miles. Is there something better out there?